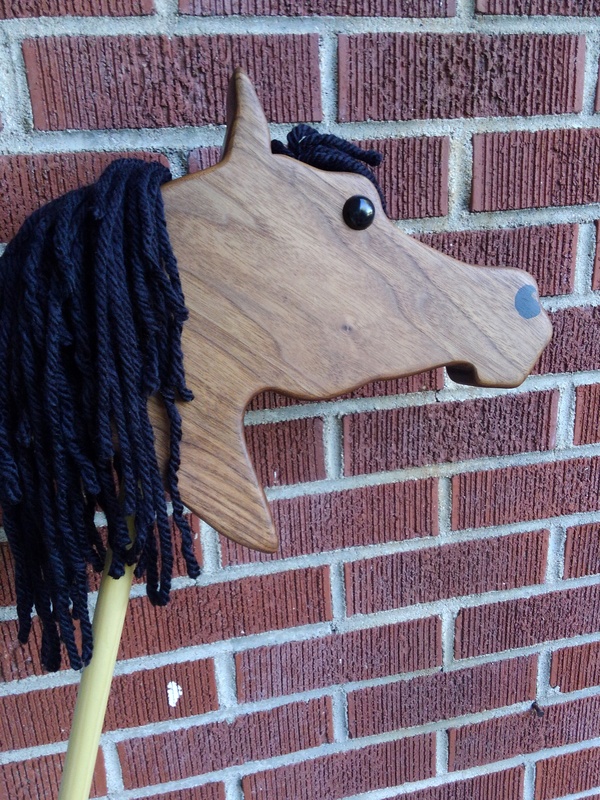 So I have not had a chance to add a section on the website for these hobby horses, but I really love making them! I made several this past week to bring to an event at the Tryon International Equestrian Center, which is only about 45 minutes away in Mill Spring, NC . 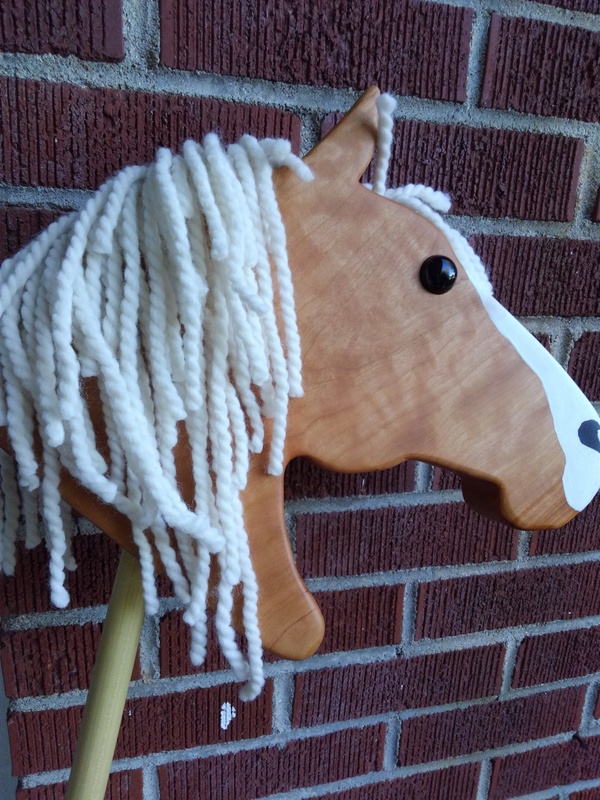 There will be a hobby horse competition this Saturday July 1st, where 18 (so far) young riders will be riding, jumping and otherwise showing their hobby horses in the show ring. 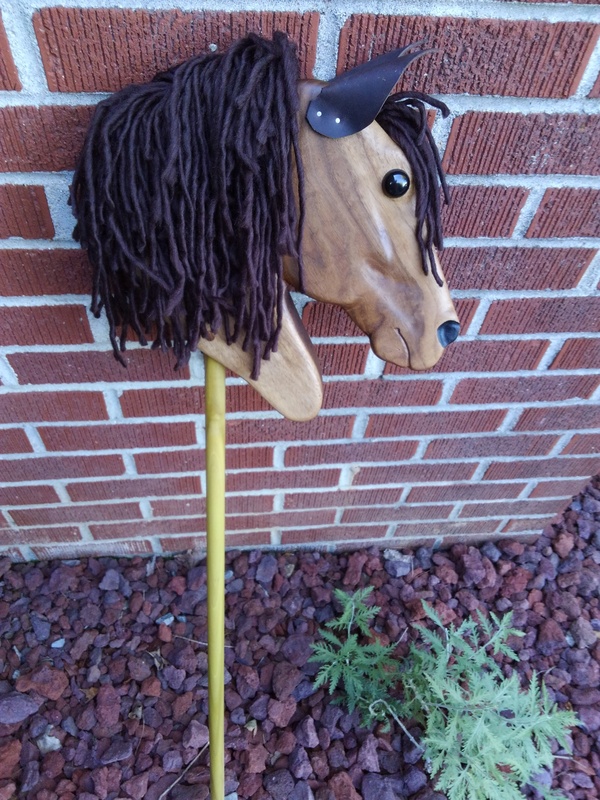 In case you haven’t heard, this is a new craze, started in Europe, which allows anyone to enter the horse showing world with just their stick horse and their own two legs. 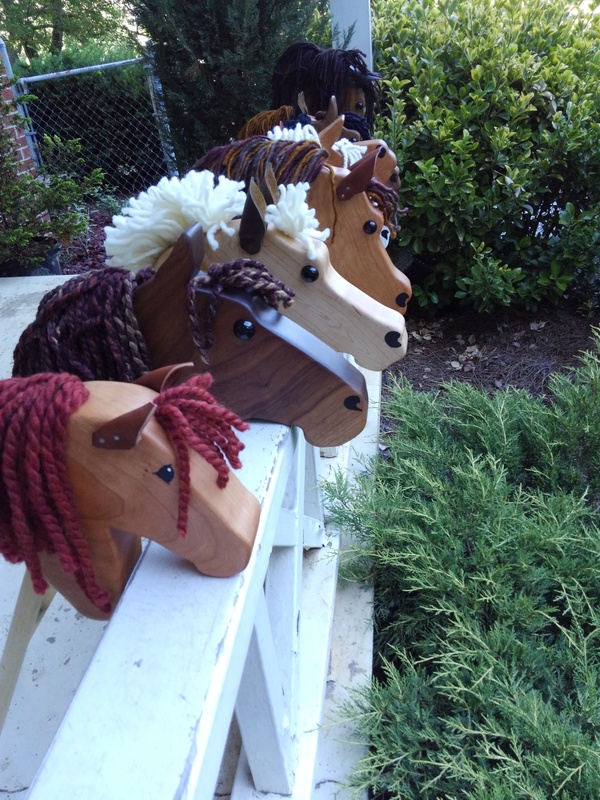 It is common for people to make their own hobby horse, but for those of you interested in something special, I have made these adorable, lovely horses ready to ride. They are wood, weigh 3 lbs or less, and are about 30″ – 35″ tall. Great for riders of all sizes to gallop through the woods or over some jumps. 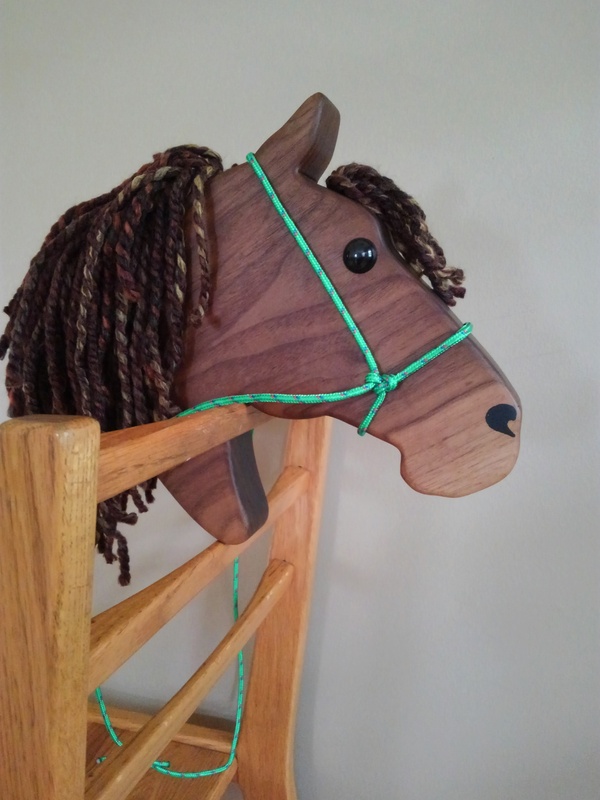 These horses are beautiful, durable, and you can customize them with a hair cut or braids, or your own hand made bridle or other accessories! Or, if you want to finish your own horse, I can give you the wood and you can paint, sand, and add whatever kind of mane you want. The options are as great as your imagination. After much fiddling, I also came up with a really simple rope bridle that anyone can make. It involves only 2 types of knots and one length of rope. I made a simple video here showing anyone how to make their own adjustable, removable rope bridle with reins. A person could really get fancy and hand stitch a nice leather bridle, but if you just need something fast, cheap, and easy, this works great! You can make a bunch of them in all different colors! I am not very entertaining, but hopefully informative! Kind of embarrassing to hear myself on the internet, but I’ll sacrifice my pride for the good of knowledge. 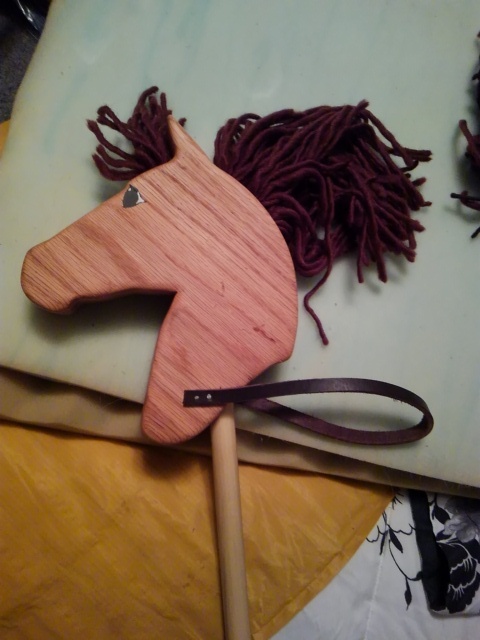 Categories: stick horse | Tags: diy rope bridle, hand made stick horse bridle, hobby horse, hobby horse rope bridle, hobby horse rope halter, how to make a hobby horse bridle, how to make a rope bridle, stick horse, wooden stick horse | Permalink.